When I originally wrote the article, “To the Ticket Agent at the Delta Counter,” I was not prepared for such an overwhelming public response. In fact, I only wrote the article because my wife suggested I do so as a lesson in seeking forgiveness and being a good example to my children. I will admit freely that, while writing the article, I had the same response as many have stated they had while reading it: I cried. For once, however, I didn’t cry solely because I tend to be overly sensitive. I cried because, as I wrote the story, I realized the importance of what I was writing. This was not just a letter to a man whom I would probably never meet again. It was not just a letter that might survive me and provide evidence to my children and future grandchildren that, once upon a time, there lived a dad who tried to do the right thing when all of his instincts told him to just drop it and move on with his lousy day. I cried for all of those reasons, but there was one reason that inspired me more than any other. My emotions boiled over because I recognized in that moment that this kind of thing happens to me all the time. I lose my temper way more often than I’d care to admit. I have yelled at my children because they spilled something for the umpteenth time or because they were two minutes late getting out the door for the bus in the morning. I have shouted at other drivers for lane changes. I have cursed at inanimate objects when they struck me in the head, which, due to my inherent lack of grace, is usually often. Despite all my best intentions and effort to teach others to be more mindful, more patient, and better parents and people, when it all came down to it, and life threw me a curve ball, I realized that I was just as vulnerable to anger as any other common man. I cried because I realized that what makes common men uncommonly great, is what they do after they swing at that curve ball and miss. That was the essence of my original story. After the story went viral, I was inundated with article comments, Facebook comments, tweets, and emails, the vast majority of which were positive and reaffirming. One response, however, I received about five days following the article’s publication, and that response left me speechless. It was from Ron, the ticket agent at the Delta counter. My station director saw your article and forwarded it to me, wondering if this was me. I remember so well that experience with you and your family. I feel so humbled having to play a part in this story. It was my pleasure serving you and I thank you for sharing such a great experience with your son. You are a great Dad. I remember those times with my now 25 year-old son. Do take care, and I hope our paths cross again. I was floored. Amidst a world with 7.5 billion people and living in a country with more than 300 million people, I was amazed to see a response circulate back to me after writing an open letter as a cathartic response, extolling the virtues of forgiveness. Though I had hoped for Ron to see my letter, I thought it was blind hope and had no idea that my hope would turn to reality so soon. Excitedly, I penned a quick response to Ron’s email, telling him more about the context surrounding our original meeting. I explained how tired my children and me were from a long weekend of celebrating with my oldest son, who had just graduated from Navy boot camp in Great Lakes, Illinois. I also thanked Ron for contacting me, trying the whole time to convey just how amazing it was to have this virtual reunion occur under such interesting circumstances, before asking permission to use his remarks in a follow-up to the original story. On the other hand, I wondered if I was being “catfished” by someone playing a cruel prank, but in my hope and optimism, I sent my response anyway. When Ron responded to this email, however, he discussed details surrounding our initial meeting–details that nobody else would have known, save for he and I, firmly verifying that this was, in fact, the same Ron who had granted me forgiveness in the airport. In my profession, I deal with many good and rough situations. I’ve been a gate agent for Delta for 34 years. I’ve served movie stars, politicians, presidents, little old ladies, very rich and powerful people, and average people from all around the world. This experience is one of the highlights of my career serving the traveling public. As I reflect and marvel even now at what I can only describe as a fairytale ending to an otherwise surreal story, I ask myself, what is the moral of this story? What can I, or any of us, for that matter, take away from this for the future? The moral is this: we do not exist in a vacuum. The things we do and what we say with and around one another all have an impact. We can never know the full extent of others’ stories when first we encounter them, but we will also never truly know the depth of impact that we may have upon someone else because of our words and actions. Even though Ron lives more than 700 miles away from me, and we had never interacted with one another before, our mutual trajectories on that snowy February afternoon crossed at an airport gate while under duress, and in that intersection of paths, our lives were changed forever. For this writer, I know that, because of the incident at the Delta ticket counter, my family is already reaping the benefits. This morning, I overheard my little boy and the younger of his two sisters getting into an argument, but just before I came down the hallway to step in and keep the peace, I heard him sigh loudly, take a deep breath, and after a couple of seconds of silence, apologize to his sister. As I peered around the corner, I saw them hug. He smiled as he looked over her shoulder, and at that moment, I knew that everything had been worth it. I can't wait to go read your original post. How true it is that we aren't existing in a vacuum. As I become more aware and as I seek greater good and greater connection with my son, I too am finally noticing those moments when I get to see the ripples left in my son's character by my words and actions. Thanks for sharing! It's great that your son indeed has learned a positive lesson from you. 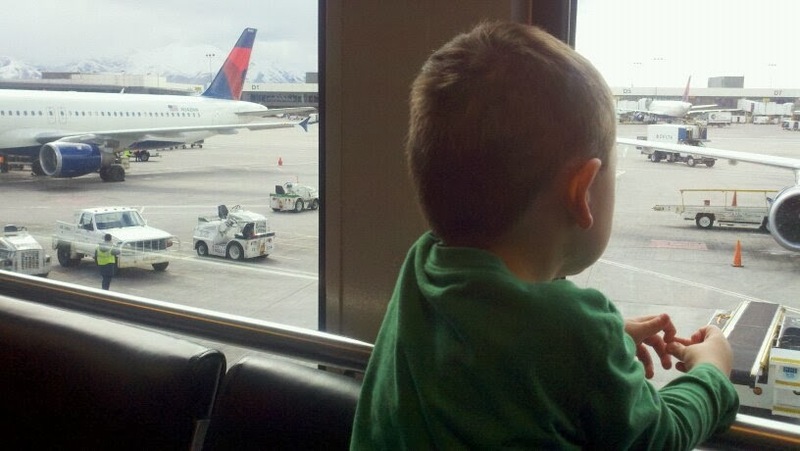 Josh – I started reading the post about your experience at the Delta counter and went on to read many posts from this blog. Every post leaves a piece of you with the readers and strikes an emotional chord. What I most loved was the simplicity in writing, yet a complex weaving of emotions which most men don't show openly. And I loved the necklace post. Keep writing and keep inspiring people around you. Well done. Great post Josh. If we could all be such good role models for our kids this world would no doubt be a better place. I re-told your story at a networking meeting as a model of how to say ‘I am sorry’ – what Desmond Tutu describes as the three hardest words to say. Your experience touched the hearts of everyone there and – unsurprisingly – brought tears to the eyes of many of the group. Thank you, Josh, for the vulnerability that is so evident in each of your blogs and for the humanity and honesty that you exemplify. Thank you for sharing this with me, Jo! It’s always nice to know that my message resonates with someone else out there!